Said in the comments they would take $150 for it. Was it a good deal? Found these while on vacation. Really wanted one but not enough time to make the run. Maybe someone here can snag one or both. Yes, I've been looking for a full wrap for mine for quite a while. Did you get it? No. I'm sure it was long gone by the time I saw the post. I have a very old loop of 3/4 pitch that was originally on a McCulloch model 99 Two Man Saw,plus a partial loop of the same from some other unknown location. 95custmz and Philbert like this. 3/4" pitch chain is used on many harvester (non-handheld) saws and bars. Unless, as the post above suggests, it is some antique chain. 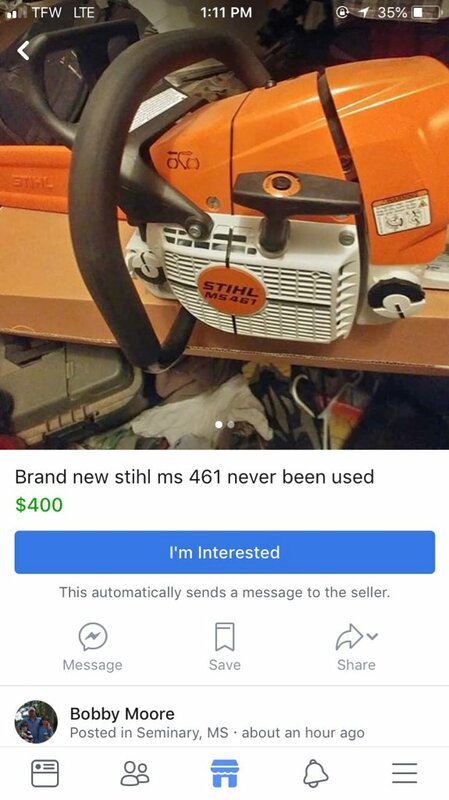 The owner of that saw is a member here, the saw is for sale here as well. Would you be willing to pick it up for me?